“Say No to an ephemeral, superficial and throwaway culture." Pope Francis issued his first ever message for World Youth Day on Thursday, choosing his theme from the Beatitudes: ‘Blessed are the poor in spirit, for theirs is the kingdom of heaven’. In his message to the world’s youth, he recalls “vividly” last July’s World Youth Day in Rio which he describes as “a great celebration of faith and fellowship”. He said there on the beach Jesus had renewed his call to each pilgrim to become his missionary disciple. The Pontiff also outlined the themes for the next three WYDs in order to set in motion the three-year path of spiritual preparation leading to the international celebration in Krakow in July 2016. The Pope elsewhere reminds young people that Jesus himself showed the way by embodying the Beatitudes in his life. That means going against the tide and being witnesses of revolutionary innovation. He told them that they could not be Christians and “think small” about life, and he urged them to resist “low cost” offers of happiness and to have the courage to be truly happy, a gift that only God can give. “The Beatitudes of Jesus are new and revolutionary. They present a model of happiness contrary to what is usually communicated by the media and by the prevailing wisdom,” the Pope commented. Of the search for true happiness, he continues, “If you are really open to the deepest aspirations of your hearts, you will realise that you possess an unquenchable thirst for happiness” and that that thirst can only be satisfied by union with God. 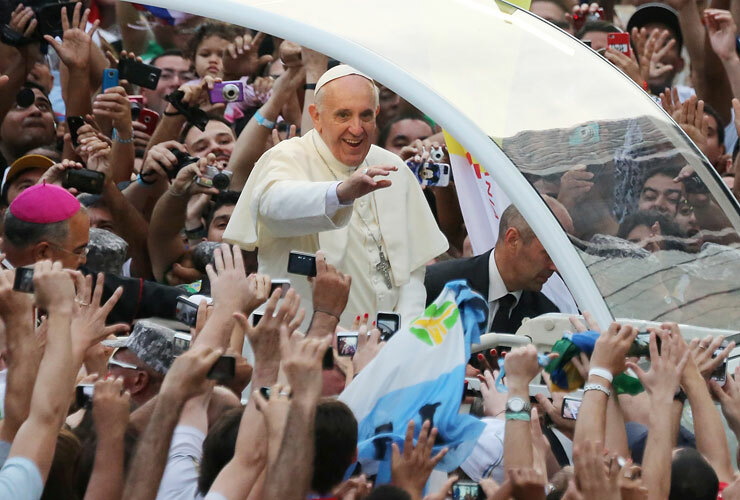 The Jesuit Pope urges young people to work towards that goal. “Say No to an ephemeral, superficial and throwaway culture,” he tells them. Elsewhere in the message Pope Francis explains to young people what it means to be ‘poor in spirit’, thus entering into the heart of the theme for the next World Youth Day. Jesus himself chose the way of dispossession and poverty, he explains and he also cites St Francis of Assisi. Young Christians are therefore called to conversion, to embrace an evangelical lifestyle, one of moderation in which we seek the essential and act in solidarity with the poor. The Pope explains that the poor are both the “suffering flesh” of Christ which the faithful are all called to personally touch. He also emphasises the close connection between the theme for Rio WYD ‘Go and make disciples of all nations’ and the Beatitude about the poor in spirit. The Pontiff notes that on 22 April this year, thirty years will have passed since the Cross of the Jubilee of the Redemption was entrusted to young people. “That symbolic act by John Paul II was the beginning of the great youth pilgrimage which has since crossed the five continents,” he states and adds that John Paul II’s canonisation in April will be, “an event marked by immense joy”.